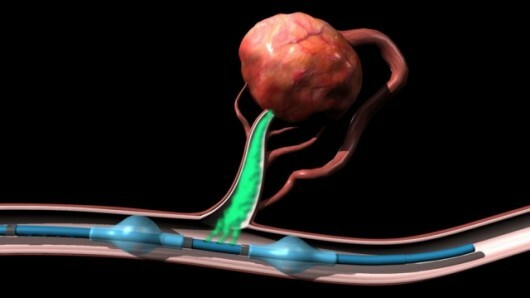 The IsoFlow Infusion Catheter Allows For More Precise, Powerful Cancer Treatment | OhGizmo! Chemotherapy is relatively effective at treating cancer. But because its effects are indiscriminate it’s also unfortunately pretty good at damaging the patient in the process. It’s often a case of who’s more durable: the tumor or the patient. 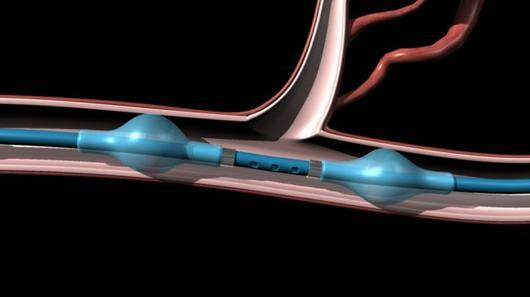 But with the recent FDA approval of the IsoFlow Isolation Catheter, all this could change. Developed over the last nine years by Robert Goldman, CEO of Vascular Designs (and inspired by the death of his own sister to the hands of the disease), the IsoFlow Catheter cuts blood flow to the tumor by inflating tiny balloons before and after the feeder vessel, then recirculating the blood through a different passage. Meanwhile, between the balloons, chemotherapy treatment can be infused directly into the tumor at a much higher dosage than could be possible otherwise. This provides for a more aggressive, targeted and hopefully effective treatment. Of course, this only applies in the case of tumors with a well defined shape and vasculature. Goldman spent two years and about US$1.8 million developing the IsoFlow Catheter and with the recent FDA approval, the product is now available for purchase. We’re not sure how much, but if your life is on the line, it wouldn’t hurt to inquire. Keep reading for more pictures, a video and links. I am currently working with a cancer research university on a chemotherapy delivery system. It involves nanopackages of drugs that once they reach their target they allow the packages to slowly release their cargo. I am actually thrilled to be involved with this endeavor. hellow, can you tell me who and where use this kind of intervention and im also interested how to contact with them? Great to see the breakthrough from an individual who has found a way to transform his personal struggle into something that will help countless others.